Players who are in the tackle position are also often known as defensive guard which is the opposition of the offensive placement. These key players are situated in the middle of the line of defence. The main role of the tackle is to stop the passer from the opposing side and intercept running plays which go through the middle of the scrimmage. There is one player in particular called the nose tackle who takes stance directly opposite the ball, however most commonly there are two tackles on the pitch with ends either side or a gap in the centre for the linebackers behind them. As mentioned above, the ends are situated both side of the tackles and are part of the front line of defence. The main role of these players is to attack the passer and prevent the opposition from running through their side of the scrimmage. 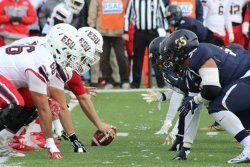 When it comes to picking who goes what side of the tackles, it often is decided depending upon the blind side of the quarterback. If they are right handed the fastest end will be situated on the right side and vice versa. And finally, behind these defensive players are the backs which are the corner back and safety. The corner back’s sole responsibility during the game is to stop the quarterback from the opposition passing the ball by swatting it away while it is in the air. This therefore stops the ball from getting to the receiver as they are able to intercept the ball. They also have to ensure that the runner is stopped from getting further down the field by tackling them or forcing them further down the pitch.When it comes to the linebackers, there are two different types – outside and middle. The general responsibility of a linebacker is to rush the passer, cover the receivers and defend against runs. The middle linebacker are those who are the ‘quarterback of defence’ this is because they are the play makers as they are able to gauge what the oppositions tactics might be and inform their team on the best ways to counteract each move. They also have the main responsibility of stopping running backs who are able to make it through the first line of defence. In terms of the outside linebacker, there are two sides – strong and weak. The strong side is placed on the same part of the field as the tight end and is used for covering the end and running back on pass plays. The weak side therefore is on the side of the field without a tight end and is used to rush or blitz the quarterback. Whoever plays in the safety role is the team’s final line of defence against the opposition. Therefore, they would need to have their wits about them and be able to intercept and prevent the ball passing them. The safety player will have to assist the corner backs with deep-pass coverage. There are two different roles in the safety which are strong and free. As it suggests from the name, the strong player has more strength than the free. The strong is additional protection against the runs as they are able to get closer to the scrimmage. Whereas, the free is the faster player and plays a deep defence which helps with long distance passes. Like the defensive side, there is also a front line of the offensive positions. Taking centre stage, the centre player starts the scrimmage by grabbing the ball and transferring it to the quarterback. Another objective of their role is to block the defensive side along with the guards and the tackles. And due to their centre position they can allocate certain players to different roles or assignments when it comes to stopping the opposition. On each side of the center are two guards whose main purpose is to block the opposition. This means that they are able to keep locked close to the center or spread apart to pursue the other team’s runs. And on the outside of these two are tacklers. Tacklers have a similar role to guards in the way that they need to block runs and passes. Depending on which hand the quarterback uses, the tackler on that side is in charge of protecting him against the defensive players. Due to this, the tacklers are often the taller and larger built players who serve as a fantastic blockade against the other team. Also towards the front line you have the tight end and wide receivers. The job of the wide receivers is that they need to run and be open for passes. There are two types of wide receivers, the flanker who is on the side of the front line and the slot receiver who is placed on the other side of the line, but further back. The tight end on the other hand is situated on the front line but on the end which the wide receiver is in the slot position. As they are alongside the line men they will often be called upon to block, but they also are able to receive the ball. And finally there are two types of backers, the quarterback and the running back. 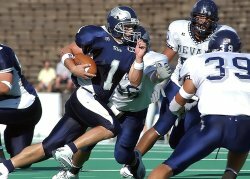 The quarterback is the player who is passes the ball from the player in the center of the line. This position is the most significant of those in the team as they are relied on to transfer the ball to the receivers, forward the pass to players down the pitch or alternatively run with the ball themselves to aim for a touchdown. The running backs on the other hand are able to have the ball passed to them by the quarterback as they are in line with one another. Once they have possession of the ball they can perform a rushing play. Depending on the squad and type of matches, there can be a maximum of three running backs during the game. Get Involved with American Football Today! It is super easy to get involved with the game! You can simply order a football from our webstore – Sports Fitness and start playing instantly. Whether you choose to play in your own back garden or at specially designed public pitches you can start at any time at your own leisure. You can also join a local club or team who practice the sport which is a great way to start your journey on playing professionally.